Microsoft has bragged about its growing app store for Windows Phone 7 devices, but the store's offerings are still puny compared to Apple's or Google's stores. The Windows Phone 7 app store has around 10 times less apps than the Android Market and around 30 times less than Apple's App Store. Will Microsoft ever catch up? Since the store's introduction, Microsoft says that out of the 11,500 apps for the Windows Phone 7 platform, 7,500 are paid apps from around 36,00 developers. Some analysts are predicting Windows Phone 7 will boom in the coming years, overtaking the iPhone by 2015, but the outlook, at least for app stores, is not that bright. For example, Apple reached the 100,000 apps milestone for its store in 15 months. Microsoft will be hard-pressed to hit that mark by the time it celebrates the 15-month anniversary of the Windows Phone Marketplace in January 2012. The discrepancy between Microsoft's and Apple's app stores grows ever more when looking at the more than 350,000 apps in Apple's store. The Apple App Store has more than 30 times more apps than Microsoft's. Even Google, which is activating more Android devices than Apple does iPhones lately, is having trouble catching up with the iOS app store. 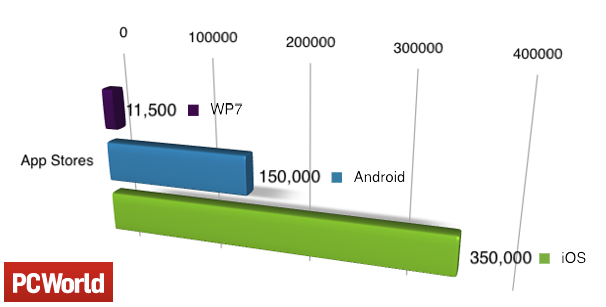 The Android Market has around 150,000 apps, less than half the amount of apps for iOS. The contrast between Google and Apple is starker in the tablet area, where Android has dozens of Honeycomb apps, while there are more than 60,000 for the iPad. Regardless, the Windows Phone 7 app store has still 13 times less apps than the Android Market. Meanwhile, Microsoft is taking the playground route to fight Apple's App Store supremacy: they're taking them to court. Microsoft started the fight in January, when it asked the U.S. Patent and Trademark Office to deny Apple's 2008 trademark application for the term "App Store." Apple is fighting back against claims that the term is too generic to trademark, and says that Microsoft should know better.